Why phone it in when you can drone it in? The selfie as come a long way in a relatively short space of time. At the dawn of the millennium most mobile phones didn't even have cameras, which meant your options were limited if you wanted to surreptitiously snap your mug against a famous backdrop, or simply pull a duck face for your own personal amusement. However, advances in smartphone photography over the past decade have given us not only amazing rear-facing snappers, but equally impressive front-facing ones, which have helped to create a global community of self-obsessed photo addicts. The introduction of accessories such as the selfie stick has taken this addiction to new levels, which begs the question: what's next in the evolution of the self-taken image? The answer may well be the 'selfie drone', such as the Zerotech Dobby (the Dobby used for this feature was supplied by GearBest). Putting aside the fact that the Dobby shares its name with a diminutive elf-like character from the Harry Potter stories, this is one seriously impressive piece of tech. It's billed as pocket-sized and, to be fair, it does actually slip into your jeans with a little encouragement. It's equipped with a 13-megapixel camera that's capable of snapping photos and recording 1080p video, powered by a Qualcomm Snapdragon processor (the same brand you'll find inside many leading smartphones) and operated via an app you download to your iPhone or Android handset. A staple of Instagram, this is one of the basic selfies, and as good a place as any to start our test. The main issue with this shot in its traditional form is, of course, that you have to be holding your phone, which tends to make the final image look a little contrived. The Dobby is a godsend in this regard, but it does require some forward planning – you have to position the drone correctly, and then take a 'timed' shot using the accompanying app. You can then put your phone in your pocket and pull your perfect pose (I went for 'disheveled bemusement' here). Of course, all this is ignoring the fact that you don't actually need a mirror to take a shot when your camera is totally mobile, but when have selfies ever been about common sense and logic? And one issue with this shot is that when operating Dobby indoors, you run the risk of it colliding with furniture or light fittings – not an ideal scenario when you're talking about a piece of tech which costs almost £300. Given the amount of setting up involved, we'd call it even between drone and camera in this case – the Dobby doesn't really make things any more convenient. When all you're interested in is grabbing an image of your smug, smiling face to share with the world, the Dobby doesn't really make all that much sense. Your phone is the perfect tool for these kind of shots, and the thought of having those rapidly-spinning rotors in close proximity to your soft and fleshy face should be enough to convince you this isn't the best use of the product. Risk to soft tissue aside, the drone does a commendable job of remaining stable indoors thanks to its optical flow technology, but we had a few too many close calls with furniture for comfort. Even the longest selfie stick in the world can't compete with the Dobby when it comes to taking dramatic landscape shots. The drone can ascend much higher than you'd ever be able to get your smartphone (assuming of course you don't own a helicopter and you haven't trained your pet budgie to carry a camera), allowing for some truly jaw-dropping pictures. Why settle for a ground-based shot of your favourite landmark when you can take to the skies and snap the ultimate image? The Dobby allows you to record 10, 30 and 60-second tracking shots in 1080p video – you can have the drone track backwards and then return, or use the app to select you as a target and have Dobby circle round you. Battery life is the biggest concern here – the Dobby's 900MHz rechargeable power cell is only good for around five to 10 minutes of activity, so you don't have a lot of time to compose the perfect shot. Carrying a spare battery is definitely recommended, but the results are worth it. Another selfie staple, the group image is a must-have souvenir of any boisterous night out on the town or awkward social gathering. If there's just three or four of you then getting everyone in the image isn't too much of a chore, but office team-building jaunts in the Scottish Highlands can pose more of a problem. The Dobby solves this problem effortlessly: simply angle the camera downwards and track the drone back slightly until everyone is in shot, and you've got the perfect group photo. Sadly I wasn't able to rope in a large number of people for my test – the long-suffering wife and kids had to do – but you get an idea of the potential for group photography. It's rather difficult to take this kind of selfie when you're using your smartphone, because you have to physically hold the device to take the snap – and this limits the kinds of activity you can indulge in. 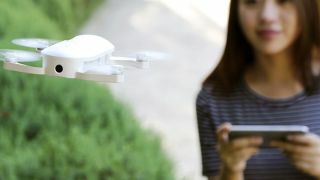 With a drone, there's no physical connection between you and the camera, so you're free to leap, jump and dash around at will. The Dobby even supports burst shooting, so you can capture several photos in quick succession to ensure you get the exact image you want. You can also use the Dobby's flight pattern options, which include orbiting and panning, to create a series of action shots or a video sequence. In this respect, the Dobby is a clear winner. There's a lot to be said for your trust phone when it comes to taking selfies. By their very nature selfies are spontaneous affairs, and it only takes a second to whip out your handset and compose a snap. However, there are obvious limitations – that's where drones comes in, and if you're serious about elevating your selfie game then they're a very useful tool. You can take some seriously impressive aerial photos and action shots – images that simply wouldn't be feasible with your phone. However, there are downsides to drones – setting up a shot takes longer as you have to get the drone in the air, and once you do, flight time is limited due to the fact that the battery only lasts around 10 minutes at the very most. The cost is also a sticking point – drones such as the Zerotech Dobby don't come cheap. Those issues aside, however, a drone offers a great means of making your selfies look that little bit more impressive, as well as being great for general scenic shooting and video recording.